This is my next to last day in the condo I’ve lived in for the past ten years. 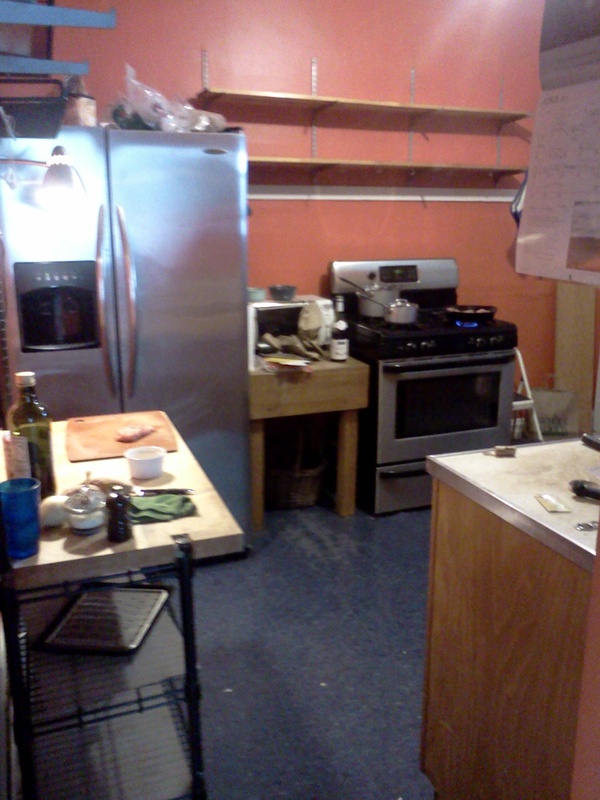 Here’s the partially dismantled kitchen, with my beloved, giant refrigerator/freezer. My soon-to-be-ex-husband and I bought the condo just before we married, which makes the move complicated and fraught with feeling. So many hopes and dreams are bound up in this place. At first I found myself incapable of packing, paralyzed. Thankfully my friends rescued me. Now, the day before my move, I’m still not ready. But I will be. Last weekend, while we were packing, one of my friends recounted the David Sedaris story about his brief stint working for a small moving company. When they showed up for a job, the movers found the client in the kitchen, cooking pasta, having packed absolutely nothing. Ha! So funny. So not any of us, we laughed. We continued packing, my friends efficiently, me sporadically, safe and secure in the knowledge that I would be ready when the movers arrived. But later that night, after my friends had gone home, I started thinking about that story, this time empathizing with that girl. Until then, I’m not sure I was capable of empathy in this situation. I’ve always been a person who does what needs doing. Absolutely not the person who lies around waiting for someone else to take care of her, oblivious. Cooking pasta while your belongings remain strewn about your apartment? That would never be me. Because such behavior would be inconsiderate, rude, wasteful. Crazy. I definitely have my crazy side, but historically it has never manifested as an inability to act. At least not in my adult life. No. My crazy has always been too much action. When in doubt, do, that’s my motto. Now, suddenly, when faced with this huge change, one that I’ve known about for months, I’ve somehow emerged into this new form in which I’m incapable of acting on my own, without help. It’s absolutely terrifying. Yet, in some strange way, also liberating. Because, somehow, I’ve learned to ask for and accept help from people other than my family. Which is kind’ve amazing. It is a gift of intimacy and friendship that before now I’ve mostly seen only from the giving side. Yet receiving is just as important. It allows for others to express their generosity, their love. On my way to recognizing this gift of receiving, I started to see that maybe the girl in David Sedaris’s story refused to pack her belongings not because she was lazy, or selfish, or inconsiderate, but because she was simply incapable of doing what she was supposed to do. I saw that because I could see it in myself. I didn’t know where to start with packing. And then I felt guilty. So I used avoidance techniques like television. Or sleep. Until my friends came over and saved me. Then, after they left, I felt capable of taking on surmountable tasks. Familiar, known tasks that I can control, things that I know how to start and finish them, by yourself. I understand this now because that morning, once I decided to cook, I lost the lethargy, felt like myself, relatively calm and in control. The contrast was illuminating. I started by looking in the freezer. Most of what was left–various flours and other dried goods–can be moved. But I still had the ribs from my hog butchering adventure in February, as well as pork stock that I made from the rib roast. (https://dreamsofmyfava.com/2013/02/24/inspiration-and-bacon-from-the-underground-food-collective/) I had initially planned to do something with just the ribs. But, while I’ve never made ribs and white beans before, I had seen recipes. And it seemed like the most practical option: and easy, nutritious (if not exactly healthy), one-pot meal that I could eat all week. In normal circumstances, this is the point where I would spend some time with my cookbook collection. I’m old-fashioned like that. I love nothing better than to lie in bed, reading about food, and then fall asleep daydreaming about individual recipes, food combinations, and menus. This time, though, I had no cookbooks, because they were the first things to get packed. And I didn’t really have a lot of time, because I’ve been weirdly exhausted. So, after a quick online search to get a general idea, I decided to wing it. What I wound up with is not at all what I planned. It far too much tomato for a one-pot meal. But what I wound up with is a terrific ragu sauce over pasta, hearty and satisfying. I will definitely make it again. Here’s what I did. 1. Drain and rinse the beans. Transfer to the slow cooker. 2. Rinse and dry the ribs. Season with salt and pepper. Heat 1 T. olive oil in a skillet over medium-high heat. Sear the ribs until brown, 3-5 minutes on each side. Transfer to the slow cooker, on top of the beans. 3. Add additional olive oil to the skillet if necessary. Saute the onions for 2-3 minutes, then add the carrots, celery, and garlic. Saute for another3-5 minutes. Add the tomato paste. Saute for another minute or two, stirring. Then add 1/2 cup of red wine or broth, scraping the bottom of the pan to get any browned bits, and turn the heat to a boil. 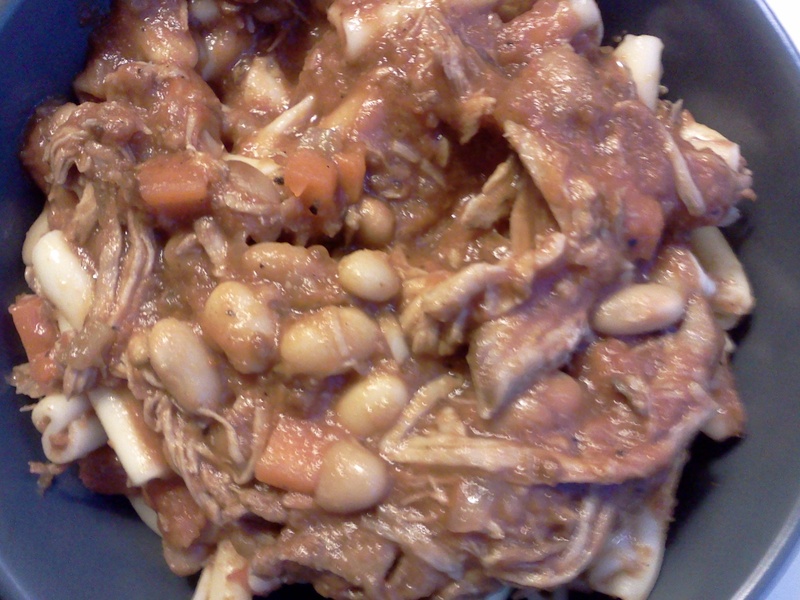 Cook for 1 minute and then transfer the mixture to the slow cooker. Add the tomatoes and remaining broth, cover, and cook on low for 8 to 10 hours, or until the beans are tender. Fish out the bones and the kombu, and salt to taste. 4. Boil pasta, drain, and top with freshly ground pepper and grated Parmesan cheese. This entry was posted in Beans, Cooking, Giving/Receiving, Happiness, Living alone, Moving, Pork, Repurposing leftovers, Slow Cooker and tagged Beans, fts, moving, pasta, receiving, riendship.